This guide class is specially designed to support our New BERNINA Machine owners, except for the B1008 model. This Stitch Fun class is a continuation of the Workbook 1 class and will walk you through further features of your new machine. These classes are free for those who purchased their machine at A Quilter's Garden ($45 for those that purchased their machine elsewhere). In this second workbook class explore the use of decorative stitches and embellishment techniques using your BERNINA Sewing machine. Every sewing machine has a straight stitch, practical stitches and a range of decorative stitches. Some have hundreds. To get the best results when sewing decorative stitches, there are several items that you need to address: the type of thread you use, the presser foot you selet, and how you prepare your fabric for stitching. We will explores these items step by stop through hands-on activities from the My BERNINA Sewing Mastery Workbook. For a complete download of this workbook click here. We will provide the fabric and interfacing used. 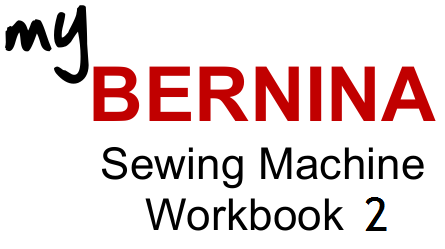 Prerequisite - My BERNINA Sewing Machine Workbook 1. Sewing machine, manual, accessories that came with your machine, thread and thread snips.